When the weather begins to change into winter, many people are thinking about ice and snow on the roads. Plumbers think about falling temperatures and frozen water expanding in pipes. 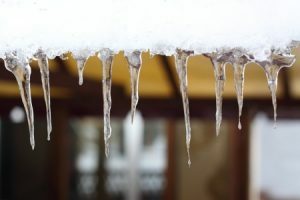 It is important for homeowners to stay alert for frozen pipes to prevent costly bursts, damage and repairs. What causes pipes to burst when freezing? Falling temperatures mean the odds of water standing in pipes will freeze. When the water freezes, it expands and that is what causes pipes to burst – and then leak as the ice melts and once again becomes water. Even minor leaks can go unnoticed for a long, long, time which can cause major damage. Or pipes could burst while no one is home and flood floors and rooms, basements or crawl spaces quickly. To help prevent frozen pipes, be sure to run water through pipes in outside walls when the temperature drops and stays low for several days. Turn on faucets to check lines, flush toilets, and run water down tub and shower drains. Also, be sure to unhook water hoses and shut off water to outside spigots. We also think of failing sump pumps during the winter months. Not so much because of the chance of a sump pump reservoir freezing, but of the flooding caused by failed sump pumps. Working with and in water in the winter is no fun – or easy job, but plumbers do it when we must. Make a date with your sump pump on your calendar – it will only take a minute to conduct a visual check to be sure that everything is in order. You will be grateful if you spy a problem before it becomes an emergency. How do you know there will be a problem? There are many causes for sump pump failures. Power Outage and Electrical Failure: The most common reason for sump pump failure is power outages. Winter power outages can be cause from ice, wind, or extreme temps. Power surges caused by electrical failure and restart or fluctuating power leaves your sump pump vulnerable to failure. Check your sump pump regularly and insure it has a back-up generator for emergencies. Another good idea is to add a surge protector to its lines. Mechanical Failure: The most common mechanical failure in sump pumps are switch problems. If your sump pump shifts around while it’s in the pit, the float activator can be rendered ineffective. If the float can’t properly activate the on/off switch, then the sump pump won’t be able to turn on, no matter how much water is in your basement. Maintenance: When was the last time you serviced your sump pump? Manufacturers’ recommendations on maintenance varies, which means you have to read the manual for your particular unit. They generally will recommend maintenance every two to three months, and then on a yearly program just before the rainy season starts. Almost all manufacturers recommend that you go outside while testing your sump pump to make sure the pipe connected to it is properly discharging water. They also will suggest that you disconnect your primary pump in order to run the backup sump pump if you have one. It is also recommended that you replace the battery on the backup sump pump every few years. Every manufacturer’s recommendations are different so it’s important to pay close attention to the manual received with your unit. Frozen or Clogged Pipes: Sump pump failure isn’t the only concern. If the pipes that discharge the water from your home are clogged or frozen the pump won’t be able to do its job. Covering the end of the pipe with a grated cover will help protect it from animals and debris. Animals find pipes cozy nesting areas and debris tends to collect in them when they lay unused for some time. Both situations can result in them getting clogged. The cover won’t be able to protect the pipe from freezing, though. For that, you’ll want to attach a special grated discharge line near your home. It will allow water to flow out of the pipe in case there’s a blockage further down. Sump pumps are essential assets to any basement or crawlspace and can help prevent costly flooding inside your home’s living area. All this can seem overwhelming, we know. But Pipe Dream Plumbing can help take the hassle out of sump pump and line maintenance. Contact us today. We want you to enjoy the beauty of winter, not worry about how it’s creating problems for your house. ← Give the Gift of Plumbing: A Practical Gift That Might Just Be The Best One Ever!